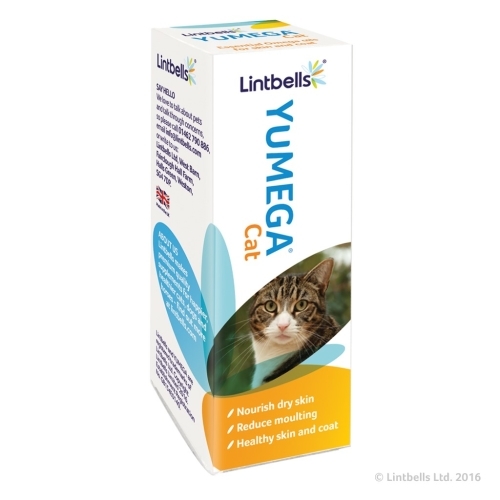 Yumega Cat is a unique blend of Omega 3 & 6 oils, obtained by cold pressing Evening Primrose, Sunflower and fresh Norwegian Salmon. Not all cat foods are a rich source of omega 3 & 6, so if your cat's fur is looking a little dull, or they're shedding excessively, try a little Yumega in their food and see the difference, it's proven to improve your cat’s skin and coat! For an average-sized 5kg cat, mix 1ml with its food each day. Smaller cats require less; apply 4 drops per kg of body weight. Yumega Cat works fast with results visible after only a few weeks and for the long term. Giving your cat time to get used to new things in its diet is important. Try adding fewer drops for the first week and then move up to the recommended amount of Yumega Cat. Your cat will accept it more readily and it will work more effectively.